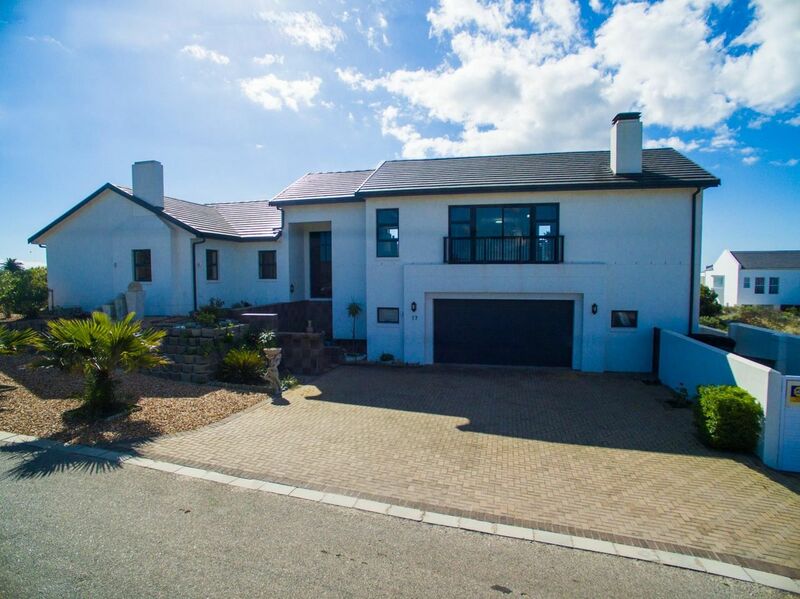 Sign up and receive Property Email Alerts of Houses for sale in Shelley Point, St Helena Bay. This immaculate home lends itself to astounding uninterrupted panoramic ocean views and entertainment with the large tiled open space living areas. Offering privacy, luxurious finishes, ideally positioned in the very safe, quiet and sought after Shelley Point Golf Estate where residents enjoy a protected and peaceful way of living. When entering the home, you are welcomed into the entrance hall leading to the 3rd bedroom or self-contained guest suite. The entrance hall also leads to the garage, laundry and store room. From the entrance hall, a short flight of stairs takes you to the first level where you find a spacious study and the other two bedrooms which both open up onto the enclosed patio leading to the garden. Another short flight of stairs takes you to the second level where you will find the lounge, guest bathroom, dining room, kitchen and braai room. This level is where everything is happening with wide open living spaces and large windows overlooking the Atlantic Ocean as far as St Helena Bay, Britannia Bay, Velddrif, Dwarskersbos and the Matroosberg mountains on the horizon. Adjacent to the lounge with a gas fireplace for extra warmth on cold winter evenings, is the dining area which opens up with stacking doors onto the braai room with a stainless steel built-in braai. The modern open plan kitchen with views of the Lighthouse, offers ample cupboards and working space with granite work tops, a double eye level oven, glass hob, extractor, adjacent scullery and walk-in pantry. Main bedroom, partial sea view, carpeted, ceiling fan, walk-in closet, full en-suite with his and hers wash basins, covered, enclosed patio leading to private back garden. Bedroom 2, partial sea view, carpeted, ceiling fan, walk-in closet, en-suite with extra large shower, covered, enclosed patio leading to private back garden. Bedroom 3, partial sea view, tiled, walk-in closet, en-suite with shower, kitchenette with built-in cupboards and own entrance. Oversized automated double garage with direct access, spacious laundry and servant toilet. The garage and laundry are serviced by a dedicated electrical geyser. Enclosed and private water wise garden with computerised irrigation, 2 500L water tank and private pergola. Under floor heating in kitchen, lounge, dining, study, all bedrooms and all en-suite bathrooms. 1x Oversized shower ideal for wheelchair access. Outside storage shed, inside storage space as well as extra storage under staircases. 2x 200L solar geysers as well as an electrical geyser servicing the laundry and garage. Alarm system and 8 beams. Extra parking as well as gated and walled parking area ideal for a boat or caravan. This impressive well maintained home offers everything that you would want in a great holiday home, or a safe and secure retirement residence. Shelley Point Golf Estate is uniquely built on its own private peninsula with 24-Hours security controlled access. The Estate offers a 9 hole golf course, tennis court, bowls, pool, gym, kiddies play area, hotel and spa. The Estate is approximately only 150km from Cape Town and the ideal holiday destination or retirement option. Shelley Point is managed by a Home Owners Association with very reasonable Levies which include 24-Hours access control, guards, alarm monitoring and response. Sign-up and receive Property Email Alerts of Houses for sale in Shelley Point, St Helena Bay.